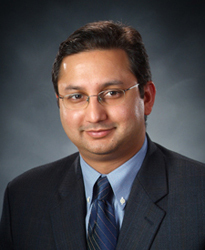 Dr. Saumya Sharma received his Bachelor of Science from The University of Texas in Austin. He earned his medical degree from Ross University School of Medicine in Picard, Dominica. He completed his internal medicine residency and his research cardiology fellowship at McGovern Medical School at UTHealth in Houston, , where he was mentored by Dr. Heinrich Taegtmeyer. Dr. Sharma went on to complete fellowships in clinical cardiology and clinical cardiac electrophysiology at McGovern Medical School. Board certified in both cardiovascular disease and clinical cardiac electrophysiology, Dr. Sharma also speaks Hindi and Punjabi. He currently serves as the director of Clinical Research for the Complex Arrhythmia Center at Memorial Hermann-Texas Medical Center and as an assistant professor of Cardiac Electrophysiology at McGovern Medical School.